Just tell us what you need and our staff will take care of all the event planning and logistics. 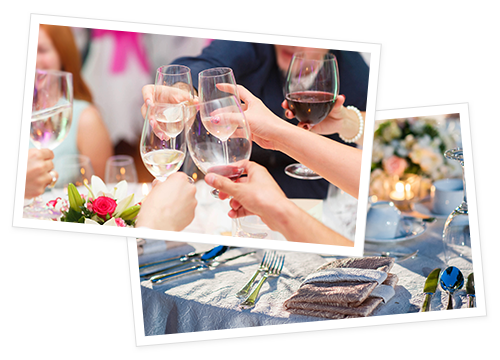 The District Event Center will seamlessly handle your special event planning. We have numerous hours under our belt when it comes to party planning and executing successful parties/events. Like most gatherings, the planner has a lot on their list when it comes to the event at hand; we want to make it not only successful, but a lot less stressful for you at the same time. We make it a priority to ensure that you, the host, can cut loose, raise a glass, and celebrate your special occasion as you should! Community, family, business or fun, the District Event Center will accommodate throughout the process to help make it great. Please let us know of any allergies when planning your menu. We are attached to the Best Western, which is a great thing for you. It means you don’t have to worry about transportation to and from the big event. That alone can be a blessing during our Wisconsin winters. The Best Western guest rooms are soundproof with hospitality suites available. When the night comes to a close, or you need to escape for a minute, the Best Western awaits with a strong triple A 2-diamond, Mobil-2 star rating. It’s time to celebrate, let us start the event planning for you, today! Leave the planning to us. Our professional and experienced staff will work efficiently to coordinate all the details for your special event. All you need to do is enjoy yourself! From plated meals, to a la carte items, buffets and snack trays, The District offers delicious food items for every palate and price point. Best Western guest rooms are soundproof and quiet with hospitality suites available. Relax and unwind in a beautiful, AAA-2 Diamond, Mobil-2 Star-rated facility when your special event concludes.